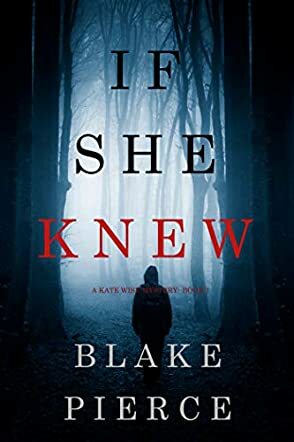 Knock ten years off Miss Marple, give her a gun and put her in America, and you've got 55-year-old ex-FBI agent Kate Wise in Blake Pierce's If She Knew, book one of the Kate Wise mystery series. Joking aside, If She Knew is far from a cozy sleuth novel. It is a fast-paced thriller with an overall more serious and mature tone. The novel opens with a murderer skillfully and successfully sneaking into a woman's home in the middle of the night. The said murderer kills his victim in cold blood while she is sleeping. Said woman happens to be the daughter of one of Kate's friends. Cue Kate Wise. Readers will follow Kate as she adjusts to her early retirement. However, as the story continues, Kate is thrown into action. As she connects the dots, she realizes what originally seemed like a simple murder investigation turns into a manhunt for a serial killer. The biggest thing that stood out for me about Pierce's story is, surprisingly, not the Julie Hicks case or the twists and turns one would expect from this genre. I am by no means saying none of that enthralled me; it all certainly did. But it wasn't the only thing that hooked me. I suppose that seems a bit odd, but as someone who has read detective novel after detective novel with the cozies in between, there is just something very refreshing about an author who can make their main protagonist connect to their readers and make their story keep readers engaged. What stood out to me was specifically Kate Wise herself. Despite If She Knew being told in the third person, Pierce manages to perfectly execute a balance between unraveling the story and unraveling Kate. I truly appreciate these sort of intricacies in storytelling more than twists and turns. Why? Because most people already expect the next story to have twists and turns, but they return for the protagonist. I recommend this novel to fans of detective thrillers; it was a great read to get lost in. I can't wait for the next one!